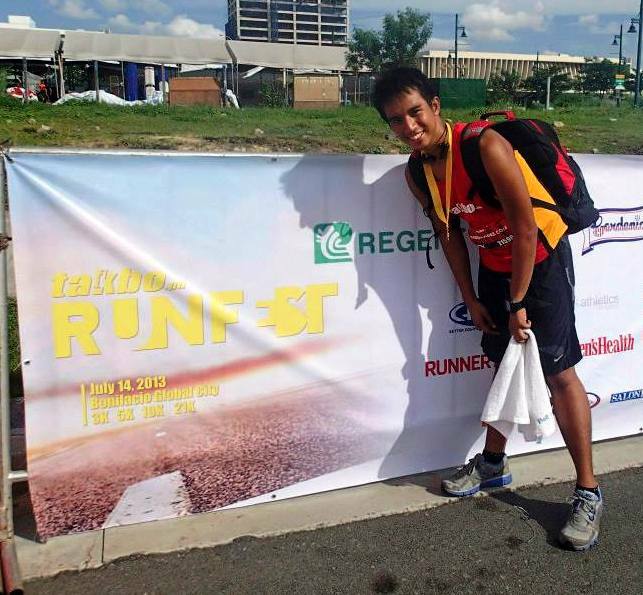 Takbo.ph RunFest is (supposedly) an annual celebration of the communities built in the running resource website, takbo.ph. 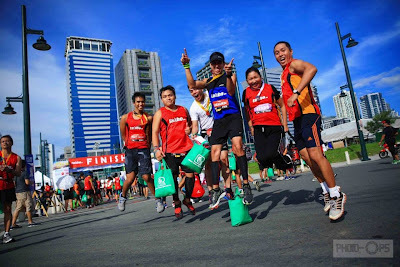 This year, it was successfully organized by the founders Jinoe and Quennie Gavan with friends and the different teams of the community on July 14 at Bonifacio Global City. With the help of running photographers, photo ops and the sponsors, the event had once again made a great memory for the running community. I had a pretty good week of training the week of the race. I was able to do my maintenance runs and had "fun" sessions at CFMNL Makati doing the WODs. However, the Friday WOD was extra challenging (let's just say I did 100+ squat like movement with weights which I don't usually use) which left me sore in the legs. I had difficult to walk after that and DOMS hit me harder on Saturday. Also, I made a crazy decision to say yes to a mini obstacle run in the Philippine Marine Barracks. The activity, despite adding stress to my already sore body, assured that I could run even if I had difficulty walking, especially when going up or down the stairs. After 4 hours of shut eye, I made my way to Bonifacio Global City. I wanted to meet Cath, who was doing her first 21k race, so we could start together but we were wearing the event singlet and there were hundreds of runners on the starting line that why I started the race on my own. Luckily, I found her with Rodel a few meters from the starting line. She told us to go ahead as she wasn't planning on a fast finish time. I was feeling my sore legs on that starting pace and the hundreds of runners in my way was starting to annoy me so I ran faster and left them to run in my own pace. I decided to do 4-1 run walk galloway for the first half and do magic mile on the second half but I quickly changed my mind on the 7th mile and decided to do galloway until the 11th mile and run at a steady pace until the finish line. The first half was spent mostly on the way and back to Buendia while passing by my least favorite road leading to Kalayaan (yung pa-uphill). During that time, I maintained a 12min/mile pace while doing Galloway. I took a few more walk breaks to have a banana and drink Pocari Sweat. I also took a bathroom break in a gas station in Buendia which added minutes to my time. The second half was more uphill roads on the way to McKinley and a surprise (surprise kasi now ko lang yun nadaanan) highway to Lawton. 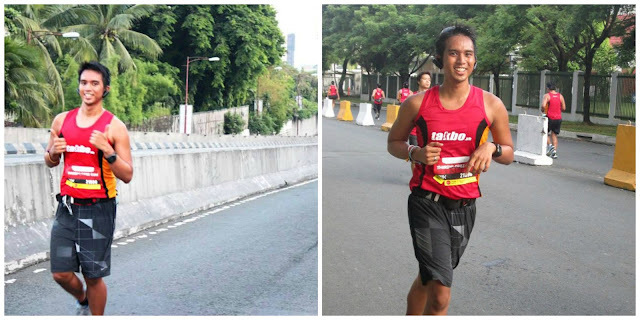 The road to the finish line passed by more hills at the British School Road passing by that damn road to Kalayaan. In that last 4km stretch, I did a pretty good pace where I could have did a sub-2:30 finish but I decided to let that newly concocted goal go when more hills came on the route. I tried to run at a steady pace on the last 3km but I had to take a few walks breaks since the route was really crazy. On the way, I found some running friends helping the event out, it was nice to say hi especially after the crazy race route. I finished at 2:32 according to my garmin. I was surprise to see Marga (who I last saw last year) and Roselle (who I ran with on Saturday) handing out medals. On the way to the event venue, I found Noel and I hanged out with him until Ryan, Rodel, Dom, CJ, Roby and Cath finished the race. After taking photos at the finish line, we made our way to the nearby restaurants on the 32nd street and decided to dine in Kuse. We found Noel and Ryan in Recovery Food, the restaurant right across. Kuse served the food fast. It was great since my tummy was telling me to eat something fast. With CJ signing autographs at the venue, we had to wait for him but his hunger pushed him to go to Bannapple in Market Market so he had to dine on his own (habang nag-eemo). We met him on our way home, though. The official race results were shortly released. Unfortunately, I can't find mine yet. This race was a fun event. Seeing friends on the road organizing the event was extra special. The race route is crazy challenging but this is great change as opposed to the easier routes of the past weeks race (Ayun lang okay yung once in a while wag naman yun laging challenging route). The hydration was lacking as slower runners had ran out of Pocari Sweat. But the bananas were abundant as it lasted even to the last runners. Also, the baggage for 21k was a chaos. They just put one bag on top of the other without any organization so when most of the 21k runners finished the line was long while the baggage personnel where looking through the pile of bags one by one. One part of the race I wanted to pin point was that the marker bands should be removed. It looks ugly and there are not even checked when you finish the race. 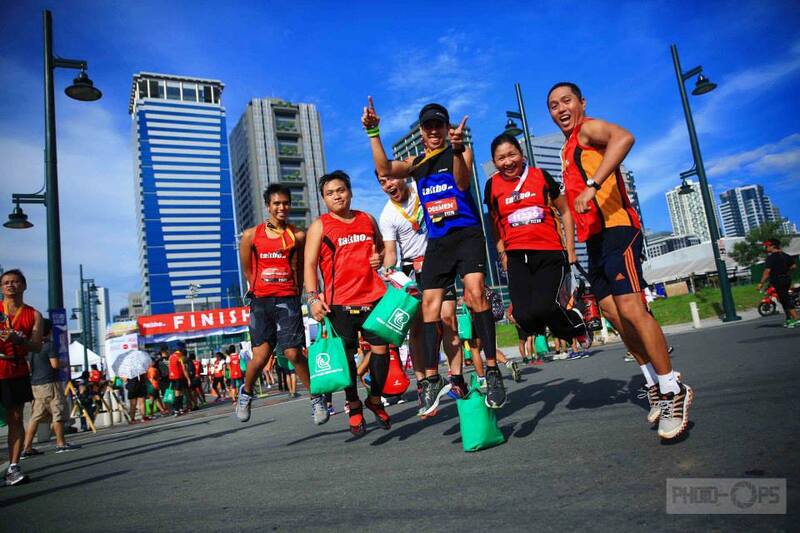 Maybe it would matter to the faster runners but to recreational runners it is useless. Organizers can save money when they just allot this bands to the faster runners and leave the slower runners without those ugly things. Another great thing in this event is you get to see running friends you have met over your running career. 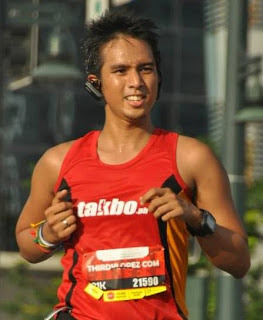 I was able to see friends from Ayala Triads, HOB, Fabulous Running Divas, Team Titans and many more. The support of known running photographers were also felt especially towards the end of the route. Overall, it was an event to remember. grabe lang ung ugly marker bands! haha! pero yes, parang wala nga syang use if it is not checked in the finish line. mas maganda sana kung icheck nila tapos pag kulang, walang medal. hehe! harsh.